Introduction to Operations and Supply Chain Management 4 Edition NOTE: MyOMLab does not come packaged with this content. If you would like to purchase both the physical text and M yOMLab search for ISBN-10: 0134111079/ISBN-13: 9780134111070. That package includes ISBN-10: 0133871770 /ISBN-13: 9780133871777 and ISBN-10: 0133885569/ISBN-13: 9780133885569. For courses in Operations and Supply Chain Management. An Integrated Approach to Operations and Supply Chain Management Introduction to Operations and Supply Chain Management is an integrated, comprehensive introduction to both Operations and Supply chain management topics. The text remains engaging and brief while integrating all of the major concepts of both subjects in one cohesive source. 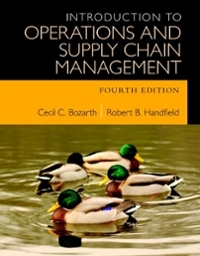 The Fourth Edition contains updated chapter content and thorough coverage of analytical tools and techniques that apply to Operations and Supply Chain Management. Introduction to Operations and Supply Chain Management explores two essential, introductory business subjects in an interesting and relatable manner by providing students with real world examples and easy-to-understand material.